Our self pack container service is a great way to save money when you are moving overseas but it is not suitable for every location and sometimes other arrangements need to be made to accommodate the container. The first thing you need to do is determine weather you have room to accommodate a 20ft or 40ft container at your residence. 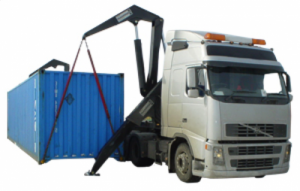 Most of our clients accommodate the container at their residence, however some opt to pack the container off site with the help of a removalist or a storage facility or both. You need to consider if your property has access not only for the container but for the delivery vehicle. You can see from the video that the swing lifter will go quite high so low hanging wires can be a problem. A 40ft container is a bigger piece of equipment than a 20ft container and the external dimensions are listed below. Most containers are delivered via a container side loading truck, these trucks will always load & unload containers on the driver’s side of the truck. This is very important to understand when ordering your 20’ or 40’ container for placement on your property. For this very reason we will always ask you whether you want the container doors facing “REAR” meaning the container is positioned on the side loading truck with the doors facing the rear of the truck or whether you would like the doors facing “FORWARD” meaning the container is positioned on the side loading truck with the doors facing the front of the truck (near the driver’s cab). This is very important as you don’t want the container placed on your property with the doors hard up against a garden bed or making you walk and extra 20’ or 40’ when loading it. A 40ft container being collected by a swing lifter.